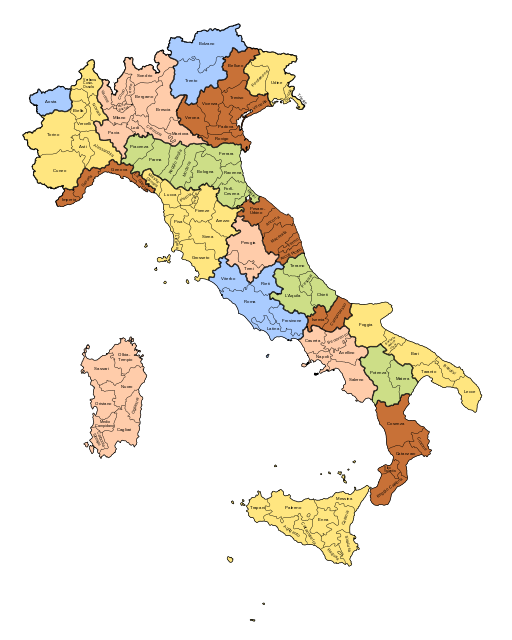 The current provinces and regions of Italy. The Italian government has decided to abolish several provinces with smaller populations, combining and redefining them, as part of a streamlining effort to save money. Not everyone is happy about it. This article from the Guardian (UK) gives some of the reasons. The number of Italian provinces has almost doubled, from 59 when Italy became a nation in 1861, to 109 today. The reorganization of provinces will take place in 2014, and affects provinces throughout the country. Last month the English language version of Italy’s Corriere de la Sera ran this article about the axing of 36 provinces. The provinces are not to be confused with regions, the better-know subdivisions of Italian government. For example, Calabria is a region with five provinces. However, after reorganization, the provinces of Catanzaro, Crotone, and Vibo Valentia will be combined into one, leaving Calabria with three provinces. The functions of provincial level governments include planning and zoning, police and fire protection, and transportation matters such as car registration and road maintenance. Some proposals have called for the complete abolition of provinces, with the regions taking over all the governmental functions. Others want to protect the unique cultural or historic character of a place, such as Benevento, which is scheduled to throw its lot in with Avellino despite Benevento’s ancient Samnite history. These changes are likely to spark some protests around the country, and are expected to be challenged in court. However for most visitors to Italy, the impact is expected to be minor. Look around and see history in the making. This entry was posted in History, News and tagged history, Italy, map of Italy, provinces. Bookmark the permalink.